I’m a Video Designer, specialized in motion graphics, animation, graphic design, video and vfx. I have experience working mainly in TV shows. Natasha Nussenblatt born in 1981 in Genoa. Nine years later she meets the biggest love of her life, her first console NES of Nintendo inexorably fascinates her and her destiny becomes immediately clear: she will devote soul and body to the graphics. With her first computer she begins to explore the complex world of design, toward which she will feel an always stronger call. During the university years at Architecture in Genoa, she grieves to vectorial graphics and photo retouch working as Graphic Designer in a photographic office. Pushed by an overpowering thirst of knowledge, she learns HTML and Action Script well soon, and the doors of Web Design open wide to her. Graduated in Industrial Design, she moves to Turin to start a Master in Digital Entertainment, discovering the complex universe of 3D Graphics, Video Editing, Vfx and Compositing. Professionally, her flexibility lets her to have various experiences in different fields, from the typographic packaging to the animated short films, from the coordinated image to the Web Editor. As Graphic Designer she creates musical cd and clothing brands, but it’s in the role of Video Designer that she discovers her vocation for the Motion Graphic, Editing Video and Vfx, working for different channels, Tv shows and music videos and proving herself to be a valid and multifaceted talent of this field, so much that she decides to do it her own preferential professional landing. 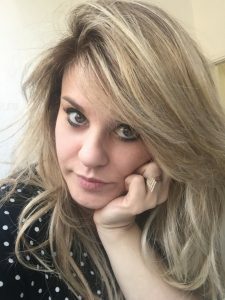 From Current Tv to Disney Channel, up to Mediaset and RAI (Radio Televisione Italiana), her experience as Motion Graphic Designer grows and becomes stronger fed by the inexhaustible desire to learn and to sharpen her abilities. Natasha is a professional figure in constant evolution: multifaceted and professional, her stratify competences make her the ideal element for creative roles and highly specialized in the branch of the Motion Graphic Designer.